Sports photographers have a tough job. They’ll take hundreds of photos during an event, and might not have a single usable picture. But sometimes luck shines down on them and they capture the perfect image. These shots deserve to be framed and hung up on walls around the world. Or shown off in this amazing collection we’ve found. You won’t believe which Indians outfielder can fly! You know the saying, “you hit like a girl?” It turns out that’s not such a bad thing. If girls hit like Chris Cyborg, then guys everywhere are in for a serious surprise! Gina Carano can block the blow all she wants, but it’s not going to help. That’s solid contact. As they say in sports, “that’ll leave a mark.” Carano wasn’t able to recover from this knockout punch and lost the fight. Still, she’s doing just fine as a movie star now. Not many UFC fighters can say they held their own against The Rock in The Fast and Furious franchise! Next, how much flexibility is too much flexibility? The flexibility of this figure skater’s body has our backs hurting just looking at it. This incredible backward flexibility shows just how hard it is to be a figure skater. Not even the toughest football players in the world could come close to this. The figure skater behind the bend is Michelle Kwan. During the late ’90s, she was the face of figure skating in the United States. Graceful and gorgeous, it was impossible to deny her talent. When she retired in 2006 she had won five World Championships. Take that, Tom Brady! 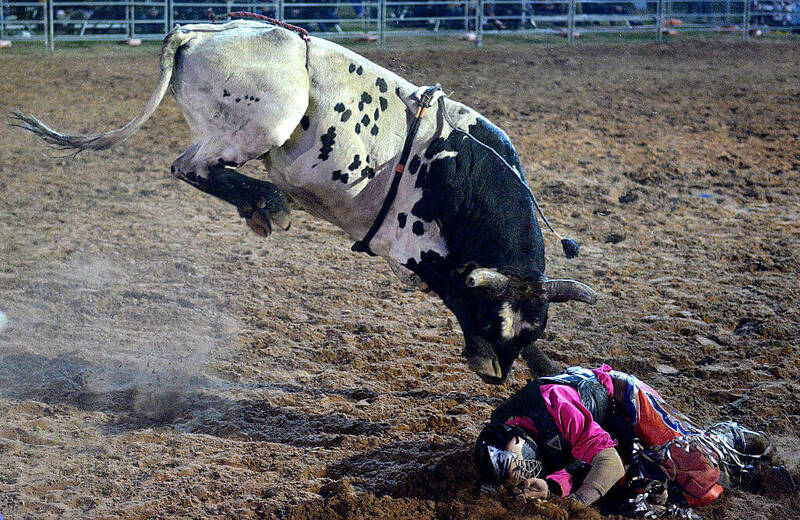 Here’s an image that is a literal interpretation of the phrase, “you mess with the bull and you get the horns.” Matt Boland learned that the hard way during the 2016 PBR Bull Riding Competition. Anyways, after Boland was thrown off, the bull wasn’t done with him. Maybe it woke up on the wrong side of the bed. Hitting the ground wasn’t enough punishment in the bull’s mind. Thankfully we’re not looking at the picture after contact. Up around the corner, Lonnie Chissenhall should probably be suspended for being able to fly! It’s a bird! It’s a plane! It’s Lonnie Chissenhall! 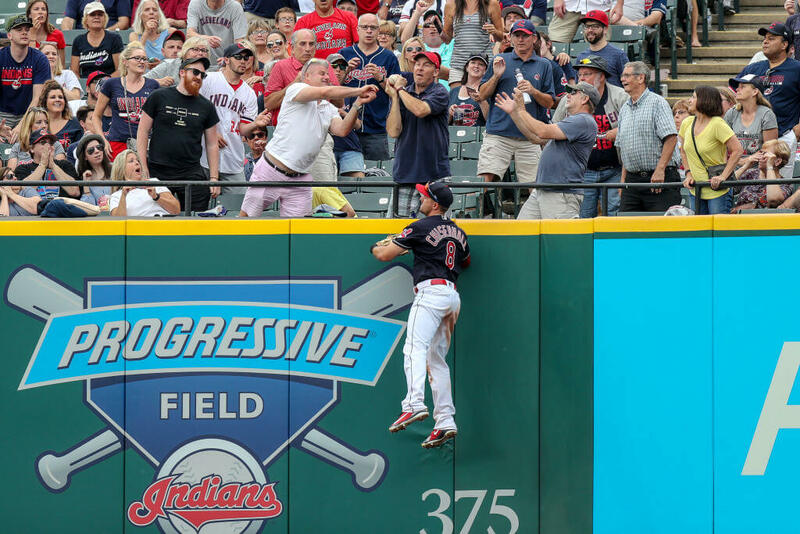 The Indians outfielder may be able to fly, but he wasn’t able to rob a home run. At least we know the fan didn’t interfere with the ball! Seriously though, how high is Chissenhall jumping? Maybe he should have played basketball. And what about the fan who caught the ball? He looks like a natural. Our best guess is he’s a season ticket holder and this isn’t the first ball he’s caught. He better have found a kid to give it to. Share the wealth, man! We don’t play professional ping pong so we had no idea intimidation was an acceptable tactic against the ball. It’s also possible this is all Ding Ning could think to do before the ball hit her in the forehead. Are concussions a problem in the ping pong community? What’s important is we officially have a favorite competitive ping pong player. 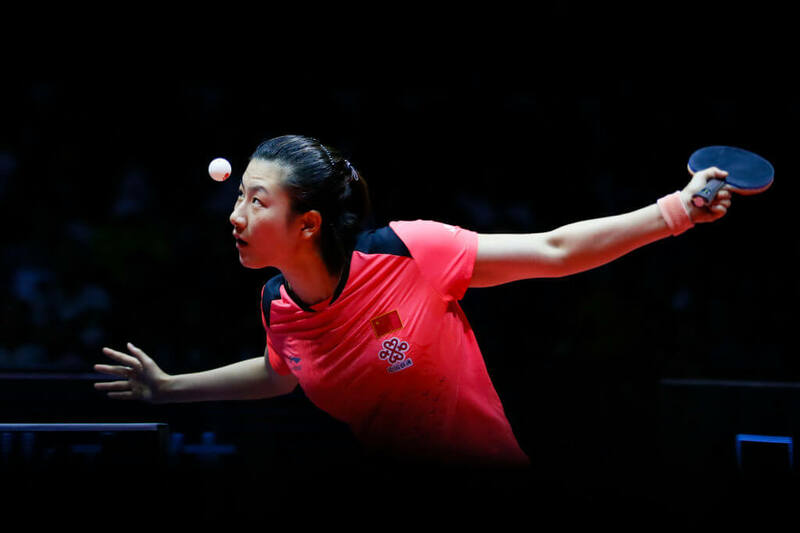 We don’t know if she beat Wang Manyu on day four of the 2018 ITTF World Tour China Open, but we sure hope she did. Still ahead, some athletes take bragging too far. 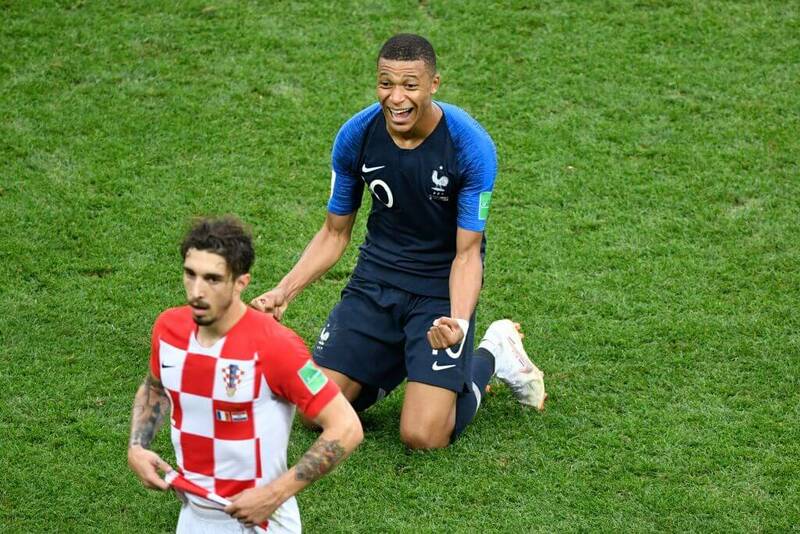 France may have won the World Cup, but looking at this photo they could have been better sports about it. It’s just rude to laugh in the face of the loser, even if he’s walking away. Look how sad he is! Give him a hug and tell him he did a good job. Don’t mock him. Your mother raised you better than that. Croatia settled for second, and now have four years to plot their revenge. Even if they don’t win it all in 2022, they just have to beat France. Then again, if history has anything to say it about, France won’t make it out the knockout stage. Just ask Germany. She thought she was competing in a wakeboarding tournament, not a parasailing one. Good thing the board she brought has enough lift to get the job done, anyways! Let’s all just hope she doesn’t lose her grip. This photo of Sasha Siew Hoon from 2014 in Thailand is amazing and terrifying all at the same time. She obviously knows what she’s doing, she just looks like she got more height than anticipated. We’re just glad it’s her up there and not us. Next, the hairy side of weightlifting rears its ugly head. We’re not exactly sure how the physics of this work. 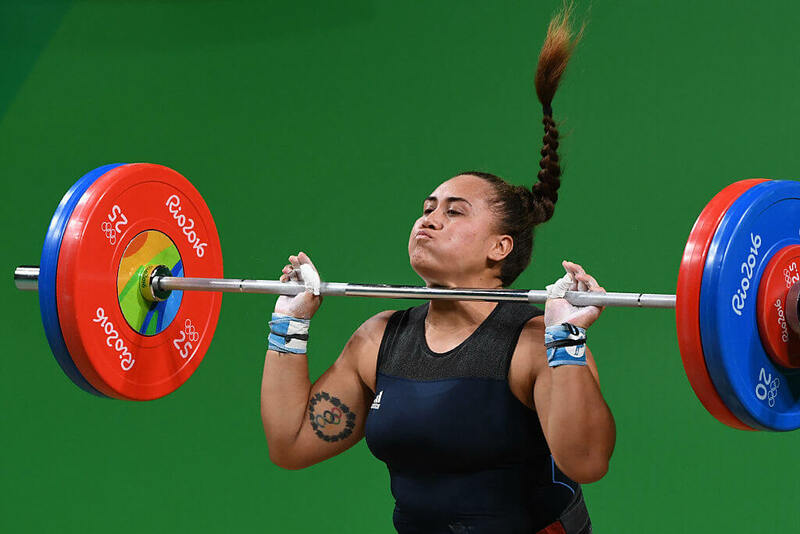 She’s pushing the weight up, which is somehow also causing her ponytail to fly straight into the air. The world is full of mystery and wonder! Or, someone is holding a balloon over her head just above the frame. 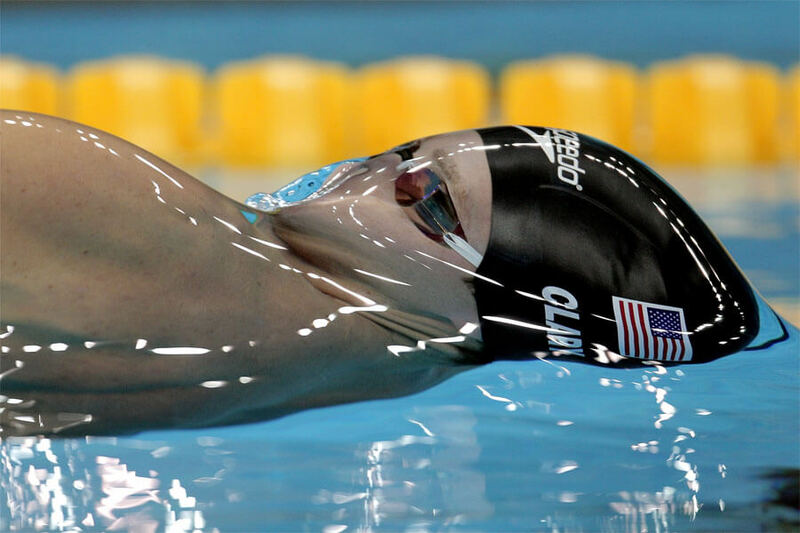 Now we know who American swimmer Tyler Clary really is. There’s no denying he’s not a muggle at all! Clary is, in fact, He Who Cannot Be Named. While the revelation is shocking, what’s more shocking is that he’s such an accomplished competitive swimmer! Fun fact: Tyler Clary wasn’t the first name he chose after leaving the life of Lord Voldemort behind him. In late 2006, the evil fiend changed his name to Clary. Before that, he was going by Scott Flowers. 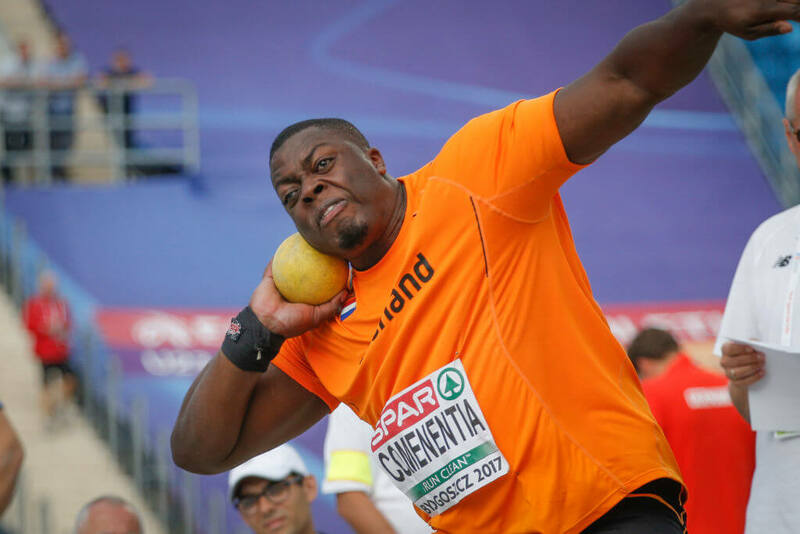 Does This Shotput Make Me Look Pretty? Shotput is not an easy sport. You have to take an excessively heavy iron ball and heave it as far as you can. Exerting that much energy really has an ugly effect on people. Just look at our friend above. You might think he has a face for radio, but it’s really just the shotput effect. Let’s be honest though, how many sports do you participate in that actually make you look good? Sports are great for your heart, but not the red carpet. Unless you’re going to the ESPYs. 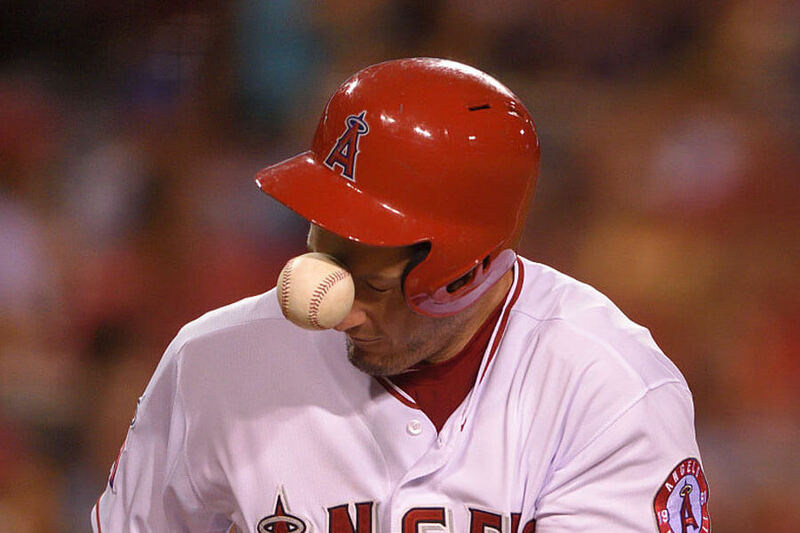 Still ahead, that one time David Freese took a ball to the face. Sometimes the best defense is using your head. David Freese took that advice a little too literally during his time with the Los Angeles Angels of Anaheim. According to our sources, he survived this brutal attack by a headhunting baseball. 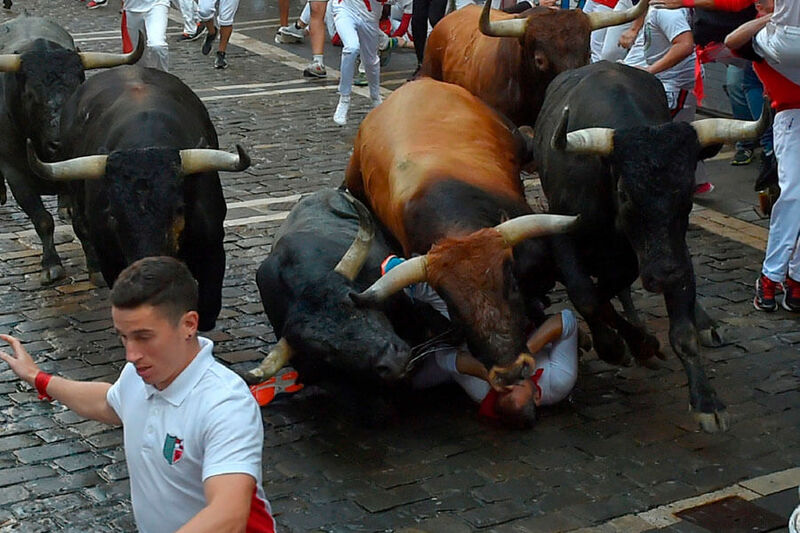 The running of the bulls in Pamplona, Spain is no laughing matter. Every year hundreds of people try to outrun a herd of angry bulls. As you can see from the picture, not everyone gets away unharmed. This poor soul was targeted by two raging animals and couldn’t get away. What’s important is that it looks like he avoided get gored by a horn. Getting trampled is still pretty bad, but not nearly as deadly. We’re assuming he had to go to the hospital after the incident, but hey, at least he’s alive! That’s Not How You Play Basketball, Dennis! It’s unfortunate that at some point in his incredible career, Dennis Rodman forgot how to play basketball. Thanks to his bad boy reputation, the two Atlanta Hawks didn’t know what to do. Could they ask him nicely for the ball? 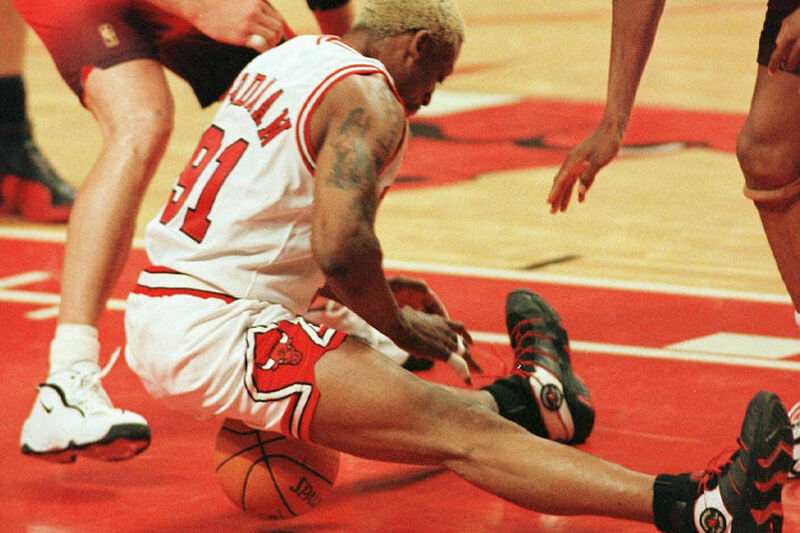 The truth is Rodman fell on the ball during an Eastern Conference Semifinal game in 1997. The Hawks did not win. 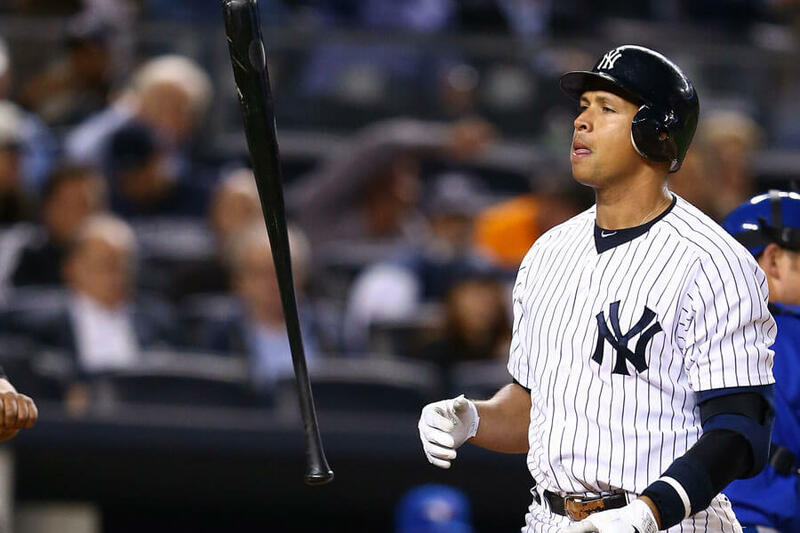 Going back to the world of MLB next; did you ever notice that Alex Rodriguez doesn’t hold the bat when he swings? So this is how Alex Rodriguez hit more than 600 home runs in his Major League Baseball career. It must be pretty easy to hit the ball when you’re not even holding the bat. Seriously, though, where did A-Rod learn this sorcery? Logically, of course, this really a picture of Alex Rodriguez striking out. He struck out over 2,000 times in his 22-year career! That’s a lot of home runs he didn’t get to hit, and a lot of bats he flipped in anger. Cristiano might be the best soccer player on the planet. Here he is kicking an amazing goal in the most stylish way possible; with a scissor kick. Rarely is a scissor kick necessary, but boy does it look good. And Ronaldo looks amazing doing it! This is not the first scissor kick Ronaldo has ever done, but it was one of his most important. The attempted shot took place during the quarterfinal match of the UEFA EURO 2012 against the Czech Republic. Coming up, learn what size baseball bat you should never swing with. 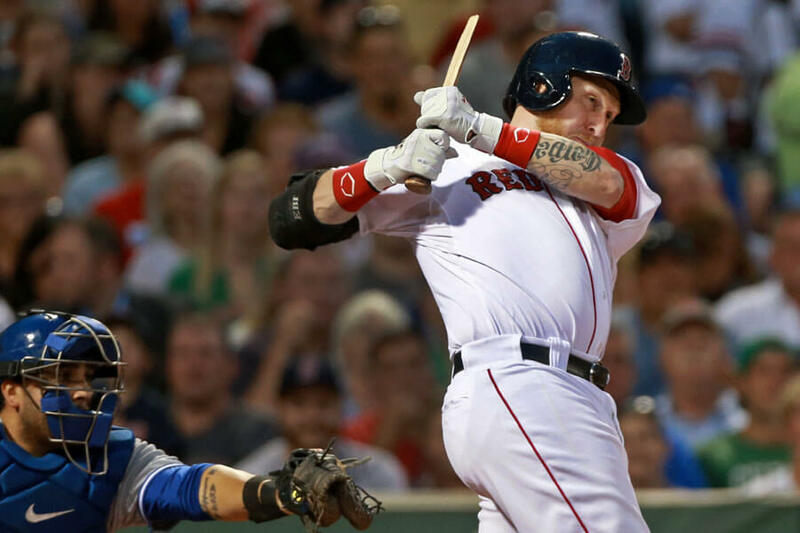 Either Mike Carp is really confident in the batter’s box, or he grabbed the wrong bat leaving the dugout. It looks like one of those mini bats you can buy in any team’s dugout store as a souvenir. Upon closer examination, this appears to a broken bat. Who knows where the rest of the bat went. Probably just a few feet in front of him. And the baseball? It popped up and was caught by the shortstop. Not only did Carp break his bat, he popped out and had to hang his head low on his way back to the bench. This wrestling move is called the “fish hook.” It’s supposed to be illegal. We guess the wrestler in red didn’t get the memo. That’s fine. The wrestler in blue has the advantage; his teeth. This is really a precarious position for both wrestlers to be in. The one in red has the high ground and what appears to be the upper hand. The one in blue has his hand in his mouth, though, and is leg-locked by his arms. Who wins? To be honest, we have no idea. 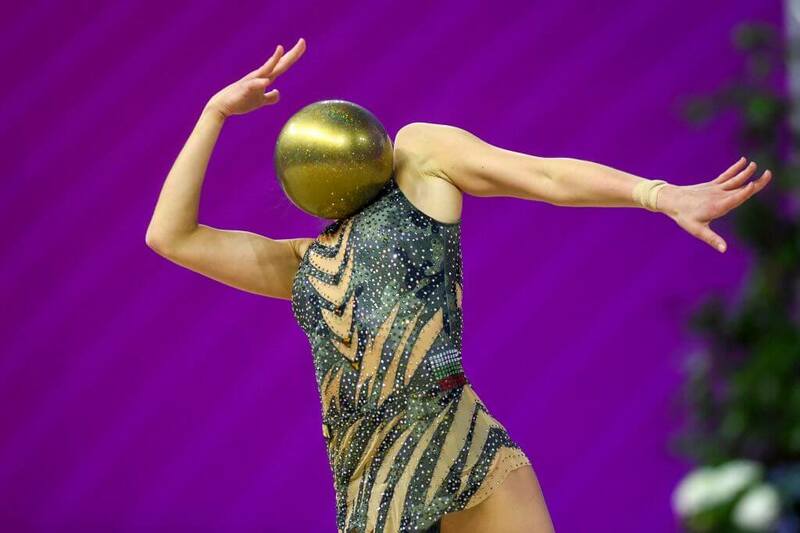 This gymnast appears to have replaced her head with a giant golden ball. It’s a bold statement to be sure, but maybe not the best life decision. How is she supposed to see, speak, listen, or even think now? Okay, we know the ball is just blocking her head, but it is hard to tell by looking at the picture. The way she’s bending backward, the ball fits perfectly at her neck where you’d think her face would be. This might just be the greatest magic trick ever pulled. Never forget there was a time in Mike Stanton’s career when he didn’t wear a faceguard in the batter’s box. This is the moment he realized that was a huge mistake. The pitch broke his jaw, requiring surgery. He had to eat his steak through a straw for months. 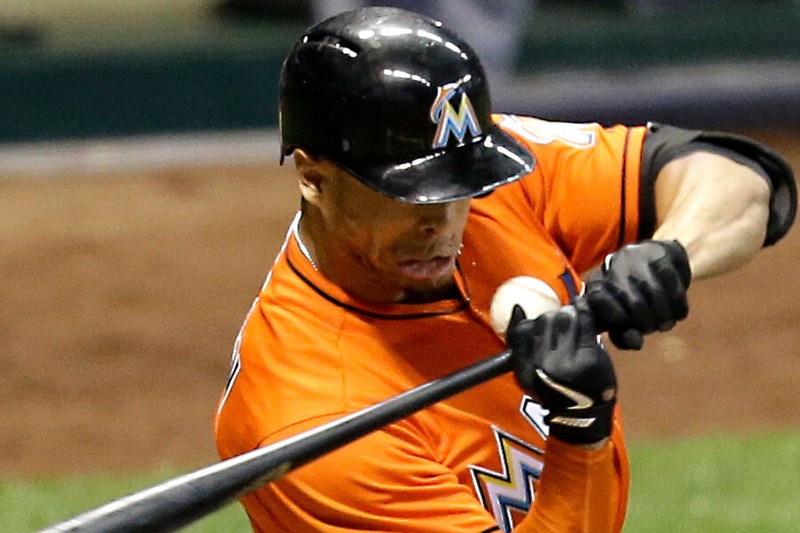 Shortly after the injury, the Marlins gave Stanton a $325 million contract. Trust us, he’s worth every penny. The problem was they couldn’t actually afford to pay him, so they traded him to the Yankees for money and prospects. 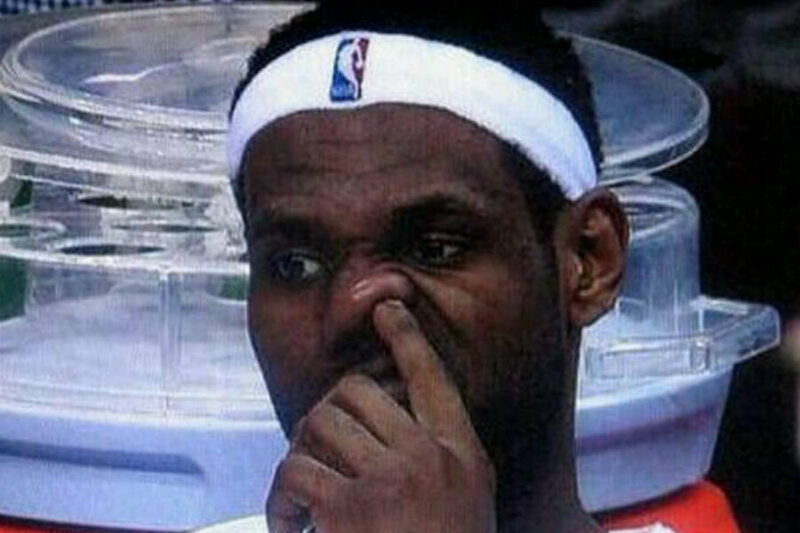 This is LeBron James picking his nose. Or, as the cool kids say, “digging for gold.” We like this photo because Golden State seems to be his only weakness on the court. Perhaps by finding some gold of his own, he can crack the code to beating them in the NBA Finals. All booger jokes aside, this picture is everyone’s worst nightmare. Imagine being caught on camera, at work, with your finger a mile up your nose. Be honest, what are the chances you’d be back up the next day?